The Encinitas Historical Society is blessed to be the stewards of the oldest building in Encinitas – our beloved 1883 One-Room Schoolhouse. This treasure is located at 390 West F Street. The schoolhouse is located on the grounds of the exciting new Pacific View Arts, Culture and Ecology Alliance. It is specially on the southwest corner of the property between E & F Streets and 3rd and 4th Streets in Historical Downtown Encinitas. This building now sits just 100 feet from its original site. In 1927 when there were too many children for the classroom, the schoolhouse was moved south down 4th Street and converted to a house. Walls were built to separate this small but adequate dwelling into a two bedroom home. But, in the early 1980’s it was sold and doomed for demotion. The Encinitas/Leucadia Historical Society (which it was originally called) and the community rallied to save this piece of our history. The school district allowed us to move it to its present location. Many fundraisers, grants, volunteer’s work and donations have continued to help to restore and maintain its integrity. 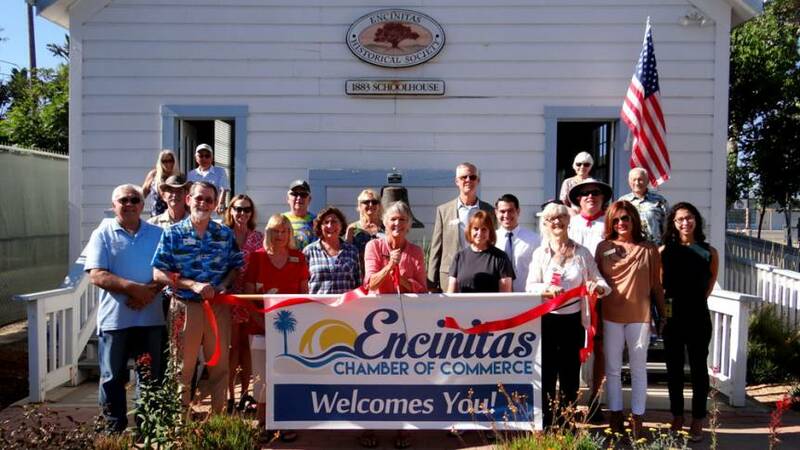 The Encinitas Historical Society’s board of members, docents and dedicated members work together as a team to maintain the health and well-being of this treasured building. They invite you to come to experience the wonderful feeling of stepping inside this historic building that has been host to countless people (and dogs) since it was built in 1883. Docents open the schoolhouse on Friday, 1:00pm to 4:00pm and on Saturday, 10:00am until 4:00pm. Come and enjoy browsing thru old photos of our area. This is a great place to connect to our city’s history.